Kindle from Amazon has gained much applauds from readers. They can read any number of e-books anywhere at any time. Kindle allows you to read even in bright sunlight as well as in dark night. Amazon is also keen in modifying kindle devices as per the feedback from their customers. Now they have launched their entry level device with certain enhancements. The new Kindle is having a dimension of 6.3*4.5*0.36 inches. The device weighs to be 161 grams which is almost 16 percent lighter than the previous device. The device is also sleeker than the previous one. 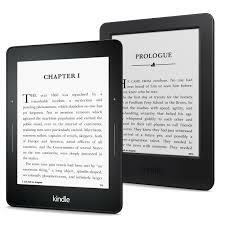 New Kindle is launched with a screen that extends upto 6 inches edge to edge. This display is Glare Free, which means you can easily read even in bright sunlight. This display is optimized by Font Technology along with a resolution of 167 PPI. It is also enhanced by E-Ink Pearl with 16-Level Gray Scale. The new Kindle is having a RAM of 512MB, which makes it 2 times powerful than the previous device. The storage of new device comes to be 4GB, which is more than enough to store 1000s of e-books. Amazon also guarantees Cloud Storage facility if you require more space than the promised storage capacity of new Kindle. This is the first ever Kindle to be enhanced with Bluetooth Audio. But unfortunately this feature is limited to Accessibility. The VoiceView screen reader works along with Bluetooth Audio allows you to enjoy a number of other Kindle features. This can be done by connecting your Bluetooth Headphones or Bluetooth Speaker with the Kindle. The new Kindle can be fully charged within 4 hours. This single full charge can be used upto 1 week if you use it only for reading without connecting to wireless connections. Kindle can be charged with the help of USB cable. Kindle supports WiFi connectivity or hotspots with 802.11b, 802.11n or 802.11g. The device also supports WPS – WiFi Protected Setup. This new Kindle supports various document formats. This includes Kindle Format 8 (AZW3), TXT, Kindle (AZW), PDF, PRC Natively, Unprotected MOBI, DOC, DOCX, HTML, JPEG, PNG, GIF, BMP and so on. In short you can enjoy almost all the file formats in new Kindle. New Kindle can be pre-ordered on Amazon website. The price is fixed at $79.99. This model is launched either in White or in Black colours. A charging cable that supports USB v2.0 is inserted in the box.